Some miscellaneous photos of Tianjin. A high speed train connects Beijing with Tianjin, and covers the 120km between the cities in half an hour. 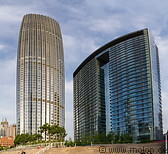 The Tianjin World Financial Center, also known as Jin tower, was completed in 2011, is 337m tall and consists of 74 floors.